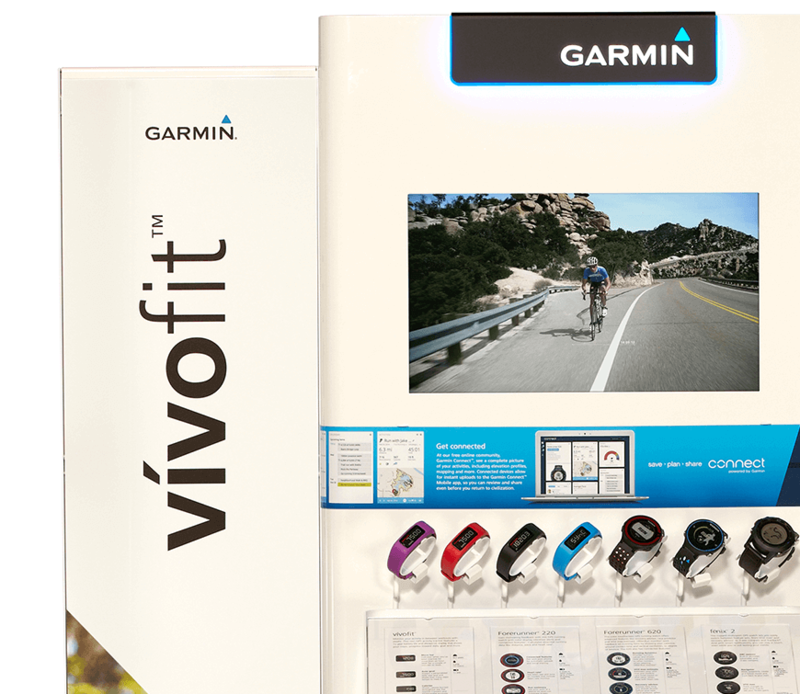 Display needed to accommodate a wide range of live and dummy products from the vivofit wearable fitness device family to VIRB Action Cameras. Design required modularity features such as: footprint, 2’, 3’ and 4’ configurations; placement, freestanding or endcap; power, high-definition monitor or graphics; merchandising, locked security case or pegged product. Strong Garmin branding was critical, along with a high-quality fit & finish to convey Garmin’s high-quality products. Created a core 2’ structure and added 1’ lifestyle graphic wings to expand the presentation to 3’ or 4’. The merchandising shelf accommodates mechanical brackets for 1-7 dummy or live devices and also conceals charging equipment for live devices. 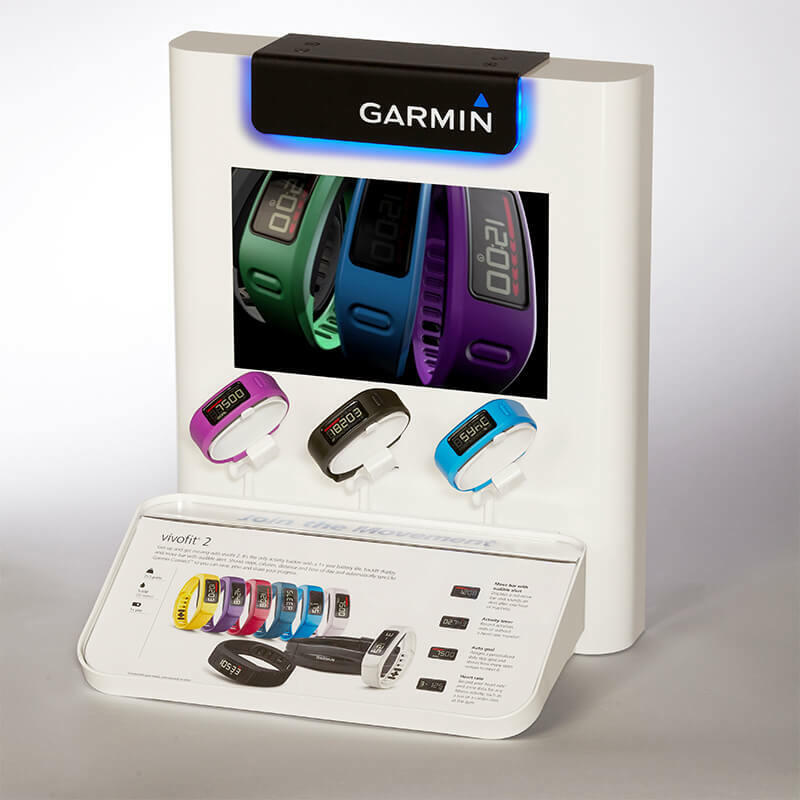 Located above the device shelf is either a high-definition monitor or magnetic graphic and an attention-getting Garmin Logo proudly positioned at the top of the display. The lower section of the display facilitates a range of merchandising options for pegged and boxed product packages including standard and locking peg hooks, shelving, and two sizes of security cases. The white metal structure provides a clean, high-tech and high-quality backdrop that is easily converted to feature Garmin’s wide range of products. Orders are placed through our online ordering web site, custom-configured from more than 300 SKUs, packed and shipped direct to retailers. Modular to allow for 2’, 3’ and 4’ widths, dummy or live product, video or non-video and locked or pegged product. High gloss white finish. Holds 1-7 products. Showcases locked or pegged boxed product. Developed a menu of add-ons to allow for a range of widths and two placement options – freestanding or end-cap. Merchandising options included: standard hooks, locking hooks, and a large and small glass security case. Product included: vivofit, running watches, cycling and handheld GPS devices, and VIRB action cameras. Garmin has communicated that the display exceeded expectations significantly and reorders have already been placed. This display’s success prompted the development of a counter unit to complete the display family. 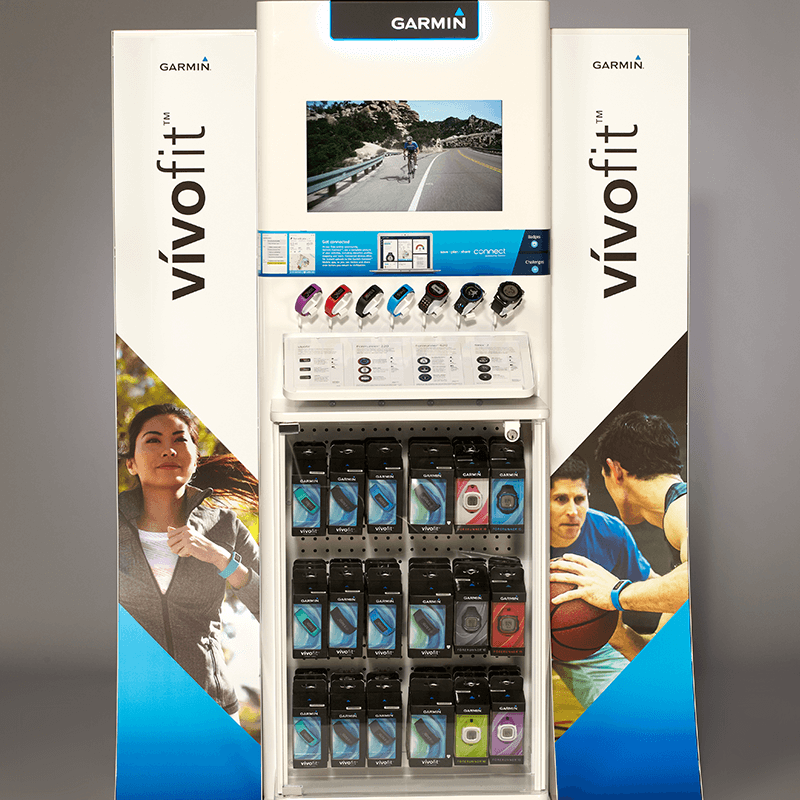 The Vivofit display became the center point of their fixture program. Process Retail Group has been Creating Results™ for 85+ years. 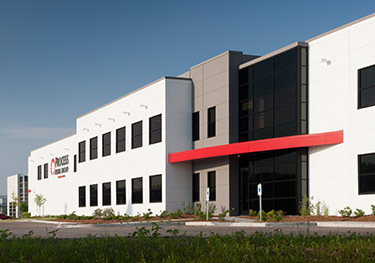 Whether an extension of your own team or a complete turnkey provider, we have your solution. Our process starts with creative thinking and innovation based on our retail expertise and field discovery of shopper insights. It moves seamlessly to detailed engineering with execution forethought bringing your ultimate shopper experience to life. We have a passion for the design and execution required to maximize the return on your in-store investment. Copyright © 2019 Process Retail Group, Inc. All Rights Reserved.